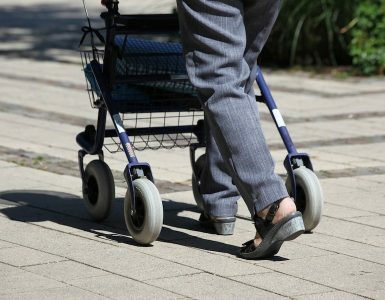 Are you tired of not being comfortable in your old, worn out wheelchair? Do you often find yourself struggling to wheel yourself around? Afraid of what might happen if your old chair finally breaks down and causes further damage to your health? Well, using the wrong wheelchair is no joke and handling one can be tough. However, having the best manual wheelchair for your mobility and physical needs by your side can help you move around with the comfort and convenience you desire! You will be amazed at what a difference it can make! We are very pleased that many manufacturers are committed to making good manual wheelchairs for their customers nowadays. We reviewed most of the manual wheelchairs on the market and picked the best for you. You can also read our in-depth review below. What is a Manual Wheelchair? What is the difference between a Manual Wheelchair and a Powered Wheelchair? 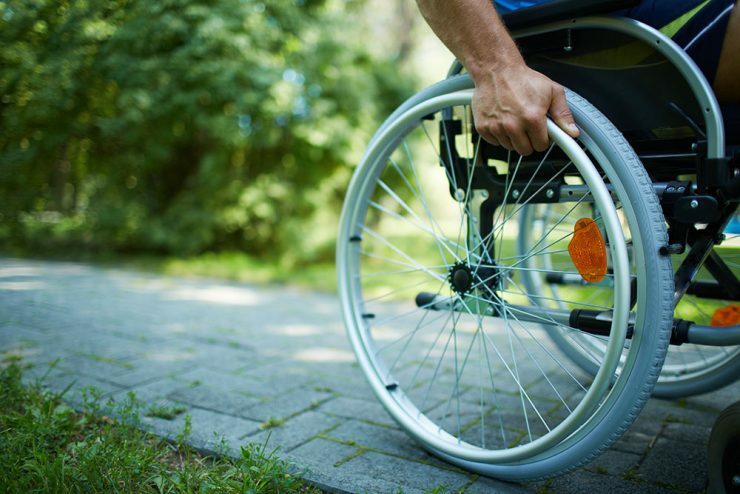 What are the types of Wheelchair Disabilities? How to choose a Manual Wheelchair Size? A manual wheelchair is a mobility device that the user can propel themselves without the use of any motor or automated electronic systems. The chairs are usually controlled by pushing on round bars that are incorporated in the wheels. They also have handles on the back so that other people can push the chair in cases where bystander manual assistance is needed. Manual wheelchairs are low maintenance and relatively cheap so most people can afford them. Depending on the type of control you want; a wheelchair can be self-propelled or transport. 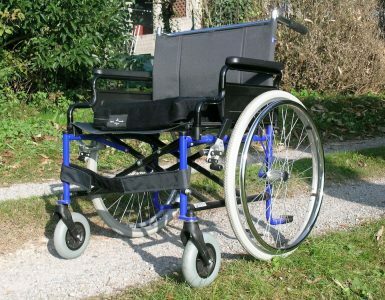 Self-propelled wheelchairs are ones that the user can move on their own if they have control of their upper limbs, whereas transport wheelchairs are designed with handlebars on the back so that other people like family members, friends and bystanders can assist in pushing the chairs forward in cases where the user is immobile or is stuck in a situation that requires assistance. A heavy-duty manual wheelchair is one that is used for users that have a weight that is larger than average. 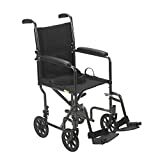 (You may need a wheelchair carrier as well) They are usually designed for bariatric patients to support weights of up to 700 pounds with reclining features to help mobility and comfort. The ultra-lightweight manual wheelchairs range between 25 to 40 pounds and are perfect for portability and travel. These ultra-lightweight manual wheelchairs give users the benefits of cushioned seats, large back wheels for self-propulsion and back handles for bystander assistance. If you’re going to get a chair for the average person that promises easy mobility and comfort, ultra-lightweight wheelchairs are a perfect choice. Some wheelchairs are specially designed for specific uses. Sports wheelchairs provide customized maneuverability for different activities like basketball, soccer etc. Pediatric wheelchairs are adjusted with smaller backs, narrow seat dimensions and back handles for adults to move around disabled or sick children. Recliner chairs offer the chance to adjust the chair’s back for maximum comfort in case of taller users who need longer backrests and greater leg room. For users with shorter stature or greater chair control through their legs than arms, hemi height wheelchairs come adjusted to lower seat heights, and also offer dual options where users can adjust the seat height according to their need. While a manual wheelchair offers users control through their own physical ability or that of others, powered or electric wheelchairs incorporate batteries in their models with options like rear-wheel control, mid-wheel control and front-wheel control. Powered wheelchairs don’t require any manual effort to move, so users never have to worry about getting physically exhausted. These are also great for users with no limb strength and other external assistance at the ready. Powered wheelchairs rely on battery power rather than physical strength, so you can travel longer distances at a much faster pace than when using manual wheelchairs. 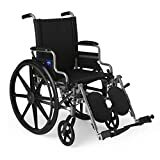 However, these chairs are much costlier than manual wheelchairs and are recommended for users who have medical requirements that make the chairs more suitable for their use. In terms of practicality, a simple manual wheelchair does the job for most medical conditions. 1) Seat Height: The seat height should be adjusted so that a person’s feet are 5 cm above the floor to help them move while standing or sitting. People who self-propel or have knee issues should adjust their seats to a higher height for better comfort and control. 2) Seat Width: A comfortable seat should be 5 cm wider than the user’s hip. 3) Grip Height: This should be up to the height of the average bystander’s waistline to allow other people to comfortably move the chair around. 4) Armrest Height: Depending on the cushion thickness, your armrest height should be 2-3 cm above elbow height for comfort. 5) Footrest Height: This must be about 5 cm from the floor. 6) Backrest Height: For self-propelling users, the optimum backrest height should be 10 cm below armpit level. When it comes to ultra-lightweight manual wheelchairs, perhaps few can match the durability and user-friendliness of the Medline. This wheelchair features a flip back design with desk length arms, which allow you to easily navigate under tables. Also included are elevating leg rests which ensure maximum comfort and ease. The durable tig welded frame, as well as the comfortable, breathable nylon upholstery, ensure that the user gets the ultimate balance of comfort and support. The product weighs about 33 lbs while it can easily support a weight of up to 300 lb. The seat is available in a number of sizes that range from 16×16 inches to 18×16 inches and 20×18 inches. However, the height of the chair is adjustable where you can lower the seat each time by about 2 Inches. The low maintenance flat free tires ensure that you never fall flat in times of crisis. It is perfect for folks who cannot walk due to some ailment or injury. Why? 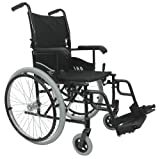 Because the comfort, support, and reliability, all contribute to making the Medline one of the best manual wheelchair! The Medline is extremely lightweight and easy to propel manually. Flip back design with desk length arms make it easy to use under tables. The elevating leg rests provide comfort and ease. The chair features adjustable height. The durable frame and flat-free tires allow for a reliable ride. The weight capacity is quite low. The Karman Healthcare company produces a wide range of high-quality wheelchairs and their mobility assistance products are met with positive ratings and reviews. Their equipment line offers lightweight, standing, ergonomic, heavy-duty and even pediatric wheelchairs. This Karman’s manual wheelchair is ultra-light in weight and it is an engineering marvel that many have claimed to be a great investment in the best manual wheelchair, not just due to its aluminum design and light weight of only 24 pounds, but the company offers a warranty for lifetime on the product as well, which is amazing. Both rear and front wheels of the chair are sturdy while the adjustable footrests are conveniently removable for comfort and ease. The chair is also quickly and easily foldable for perfect storage and portability. One of the greatest attributes of this chair is that the seat height is also adjustable, making it perfect for taller users. You can even contact the company to have extra features or add-ons provided for your needs. If you’re looking for quality service and company involvement, the Karman 24 pounds Ultra Lightweight manual Wheelchair is perfect for you! The chair is lightweight for easy transport. The chair is foldable for compact storage and transport. The seat height and footrest are adjustable for comfort and convenience. The company can give add-ons. It has smaller wheels than most other chairs. 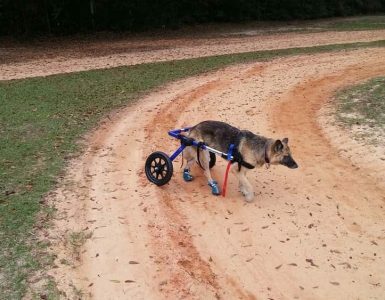 Front wheels aren’t as durable as those of other wheelchairs. Hand wheels can be uncomfortable for certain users. When it comes to the best manual wheelchair for everyday use, the Drive Medical Wheelchair simply refuses to go unnoticed. It is a wheelchair engineering marvel by the famous Drive Medical wheelchair brand that is specifically designed for people with medical problems such as injury, illness, age, or disability. The wheelchair supports the needs of most wheelchair users who look for an efficient mobility device that is both lightweight and offers great maneuverability. With its sleek design, the wheelchair is easily controllable through tight indoor layouts and spaces. It allows perfect navigation even within narrow spaces and also guarantees easy control through bystander assistance. You can move through your homes, rooms, and doors effortlessly without worrying about space or control. In addition, the design makes the chair lightweight and includes strong composite 8-inch wheels that let the chair be maneuvered on various types of ground surfaces, as well as a durable steel frame that makes the chair stable overall. With the chair’s cushioned armrests and swinging moveable footrests, you’re also guaranteed great comfort and convenience. 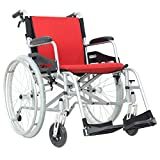 So, for anyone looking for a fully functional manual wheelchair with comfort and maneuverability, this is the best manual wheelchair for you. Detachable armrests and swing-away footrests offer customizable support. 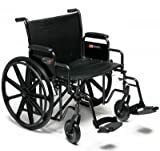 19″ padded nylon wheelchair seat provides comfort and easy cleanup. Durable steel framework and tires make the chair stable. Design allows maneuverability in narrow spaces. Foldable for easy and convenient transport and portability. Heavier than most other wheelchairs. Narrow design not accommodating for slightly larger users. Specifically designed to cater to all types of wheelchairs disabilities, the Hi-Fortune Manual Wheelchair is perfect for those suffering from a lower back injury. The sleek design and lightweight material make it easy to propel for long hours. The frame of the chair is made from strong, ultra-lightweight magnesium alloy that provides sufficient support. The best part? The frame can easily fold down using a quick release hinge for better and efficient storage. So, you can easily store it in the trunk of your car, under your bed or even in the overhead compartment of planes. Moreover, included for your premium comfort are padded armrests and swing away leg rests. Afraid of a bumpy ride? Well, the large oversized rear wheels can overcome the most uneven surfaces. The chair includes handbrakes as well so you can easily control the movement and speed of the chair. The chair weighs about 21 lbs while it can support a weight of up to 220 lbs. So, your search for the best manual wheelchair ends here with the Hi-Fortune and its lightweight design! The Hi-Fortune weighs only 21 lbs while having a large weight capacity. The armrests are padded while the leg ones can be adjusted. It is easy to control the speed using rear and front handbrakes. Also included are anti-tippers that allow you to drive up a slope without tipping. The durable frame and breathable upholstery ensure comfort. The chair can be folded for efficient storage. The weight capacity is very low. Nova is one of the most acclaimed brands at manufacturing the best manual wheelchair. The Lightweight Wheelchair is no exception! This reliable and durable chair is perfect for all who desire an easy way and independent way to propel themselves. The weight of this seat is a mere 33 lbs. However, it can support up to 300 lbs. Furthermore, it is equipped with flip back desk arm which makes working in an office or eating at a table easier. Also included are swing away footrests for your ease and comfort. The best part is that the height of the seat is adjustable due to the dual axle positions. The black chrome finish frame is flame retardant and durable as well. The black nylon upholstery is soft and comfortable. It is breathable as well to allow for perspiration. It can be folded down as well for convenient storage and easy portability. The Nova Lightweight Wheelchair is the choice medical cruiser for all those folks with different types of wheelchair disabilities! The Nova is the perfect wheelchair to propel yourselves. It is lightweight and can support up to 300 lbs. You can easily work or eat on a table due to flip back desk arms. The height of the sea is adjustable. The upholstery and frame provide ample support and comfort. It can be folded down for better storage options. It is heavier than other seats on this list. The Graham Field’s Wheelchair is specifically designed for those who have trouble staying in a wheelchair for too long. Confused about how to choose a wheelchair size? Well, this wheelchair offers a universal size that is fit for all. The depth of the seat is about 18 inches, about 2 inches longer than other wheelchairs. It provides a comfortable seat to the user. While the seat itself is lightweight, however, due to its durability and leatherette upholstery, it can support up to 500 lbs of weight. This wheelchair is equipped with a wide variety of features such as removable armrests, desk arms, swing away footrests, dual axles, double crossbars, and so forth. Also included are semi-pneumatic front casters that are durable and sturdy. The Graham field paramount, the best manual wheelchair, is affordable as well! The seat is lightweight and supports a large weight capacity of up to 500 lbs. It has a lot of features such as removable armrests, swings away footrests, desk arms et cetera. The seat is about 2 inches deeper than standard wheelchairs. The upholstery is soft and breathable. It has only one size. Last update on 2019-04-24 at 08:04 / Affiliate links / Images from Amazon Product Advertising API. Nothing on this site should be construed as medical advice. This website is for informational purposes only. Mobilitywithlove.com is a participant in the Amazon Services LLC Associates Program, an affiliate advertising program designed to provide a means for us to earn fees by linking to Amazon.com, Amazon.ca, Amazon.co.uk and affiliated sites. Amazon and the Amazon logo are trademarks of Amazon.com, Inc, or its affiliates.